We’re bringing a different kind of feature to you today, readers. 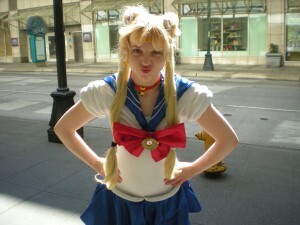 Below is an interview I conducted with Rina Love, a Sailor Moon cosplayer I met at Sakura Con 2011. She was also the organizer of the Sailor Moon picnic photoshoot! Images used with Rina Love’s permission. Please tell us a little about yourself and how you decided to become a Sailor Moon cosplayer. Ever since I was little (5 years old), I’ve loved Sailor Moon. 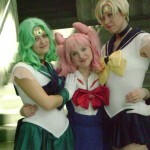 I didn’t learn what cosplay was until I was 16 and decided to dress up with my best friend as Sailor Mini/Chibi Moon. So my love of Sailor Moon kind of just made me fall into cosplaying from the series. What first got you interested in cosplaying anime characters? My friends who told me about these conventions and googling cosplay! It all started With Sailor Moon though. What was the first anime character that you cosplayed? Sailor Chibi/Mini Moon was my first, but if you count my other two costumes I made for the same convention then it would also be Plusle (Pokemon gijinka) and Nijihara Ink from Moetan. What other kinds of costumes have you created (anime or otherwise)? What are some of the more notable ones previously created? Well, I’ve only been cosplaying for 2, almost 3 years so my list isn’t spectacular, but other types are anime based, sci-fi movies based (Pris from Blade Runner), video game related, and tv/book related. My most notable and favorites are: Sailor Moon from the Manga-first arc. My dad made me the staff and I spent over 30 hours creating everything, a lot of that was hand sewing as well, and I made everything aside from my leotard (because it was cheaper to purchase) and my boots “base”. I did hand sew on the white pvc leather and gold crescent moon to the boots though. 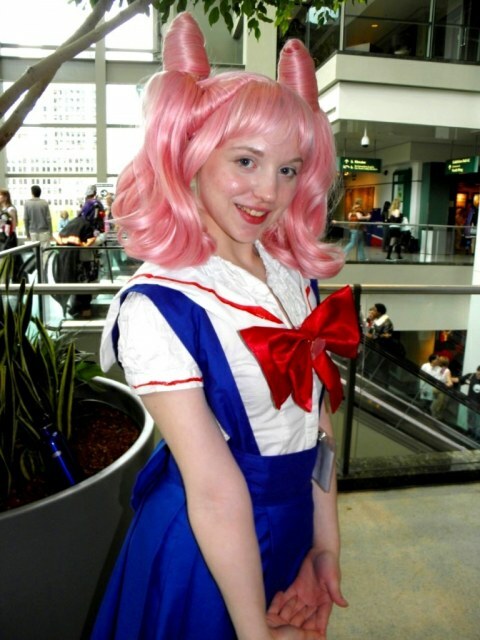 My other favorites are: School Uniform Chibiusa-from the artbook illustrations of her short t-shirt of the Dream arc. 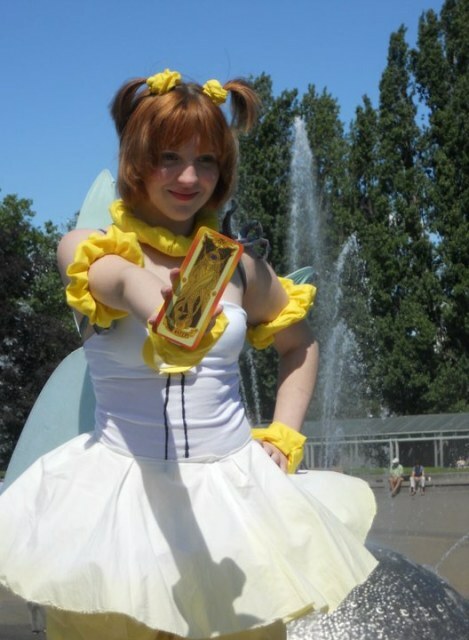 And Cardcaptor Sakura-Sakura Kinomoto. I made this in two days time basically, and based it off the anime and manga drawings, so it’s sort of combined. How many costumes have you made (wholly or partially)? How long does it take to create a senshi costume? 30 hours or more. Time is usually spread out over a period of weeks though. What’s was the most challenging costume you’ve ever had to make? Sailor Moon thus far. It was for a performance group, so on top of making everything it needed to with stand the stage and not fall off. What are some of your planned upcoming costumes? Will you be doing different costumes each time, or do you re-wear costumes at events? My planned costumes for next year and to cap off 2011 are: Tinkerbell, Gwen Stacy (my “Halloween” costume), and Neptune-christmas edition. For 2012, I hope to complete a lot more! These are my plans: Neptune (Hyperdimension Neptunia-Sakuracon 2012), Tinkerbell (updated-Tinkerbell movie’s version), and Small Lady. I will rewear some of my costumes, but I also wear different costumes each time:) It all depends on the costume and how much I wore it the first time and how many photos I have of that costume. If you have performed skits or dances in cosplay, what advice do you have for cosplayers who plan to perform skits or dances in costume? I have performed in a dance in cosplay and my advice is to be prepared, always expect the worst to happen and don’t dilly-dally on wigs! Order them months in advance because if they’re not they’re in time, and if you don’t have a backup plan (like, your hair won’t work), then you’re kind of out of luck. My wig didn’t show up in time for the performance when it was supposed to get there a couple days earlier. So my friend and partner got extensions which luckily matched my hair, and luckily my hair was long enough to be worn in buns and styled as Usagi’s. (My hair was also a platinum-golden blonde). Another thing: be timely, and get ready hours beforehand! Rushing at the last minute makes nobody happy. What advice do you have for people who have never cosplayed before and are just starting to get interested in it? Cosplayers can be mean, but they’re human. Avoid those sites that belittle people, because in effect, it can make you feel bad about yourself. People are going to judge you no matter what, but look for allies and friends in the cosplay community who Don’t bring you down. Also, it’s perfectly alright to buy your costume! Just research the person you’re purchasing from, and learn your measurements! Also, make sure the costume fits properly and isn’t too big or too small. Nothing looks worse than a slopped together and ill fitted costume. Oh and you don’t need to enter a contest to have fun or make new friends or get your photo taken! But keep in mind, the more popular and well made and put together a character, the more photos! Don’t get discouraged if you get no photos in a costume you love, it may just not be known. Anything else you’d like to add for the readers of Moon Chase? That’s all for today’s interview! 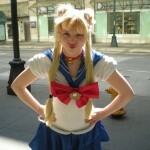 We hope you enjoyed reading this insight into making Sailor Moon costumes. 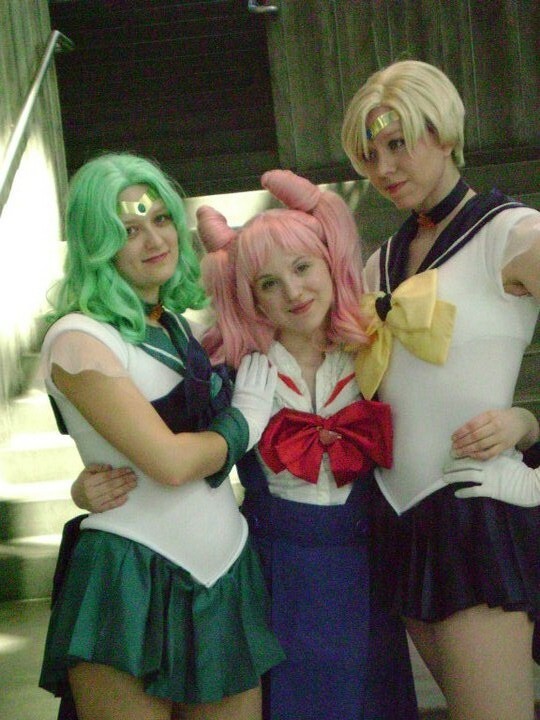 If you are a Sailor Moon cosplayer and would like to be featured on Moon Chase, please send us an e-mail! By now readers have likely read through my previously posted convention coverage. I reported on a variety of events to give a well-rounded view of the convention and I hope our readers have enjoyed it! In this final post of convention coverage, I’ll talk about a few of the other events I attended more briefly than the previous posts (which is why I’m putting a few together in this one). 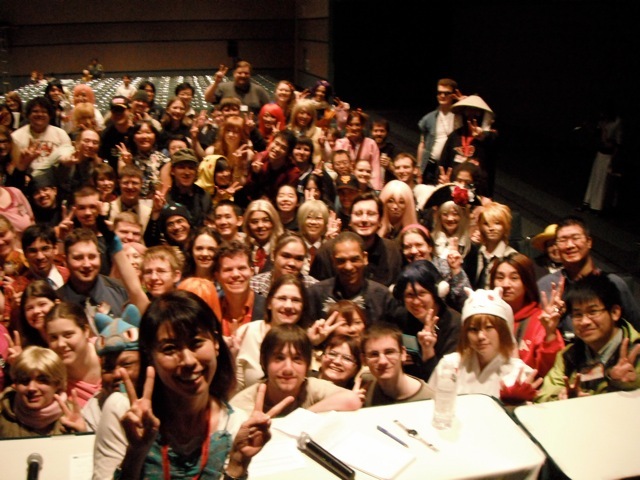 For any readers who did get to check out Sakura Con first-hand, we hope you had a great time! 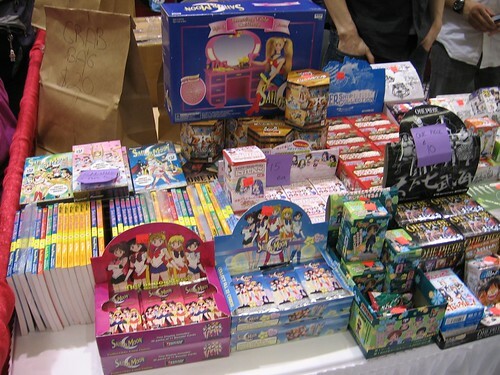 I’m including photos of some Sailor Moon merchandise I purchased at the convention in this post as well. 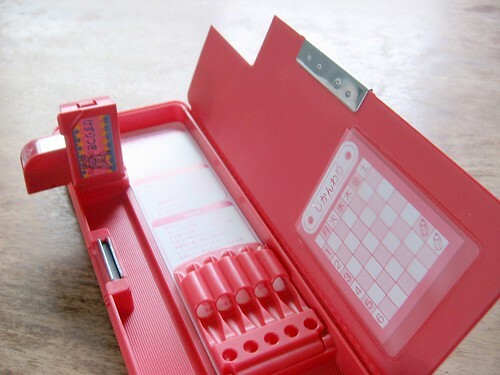 I bought a pack of trading cards and a pencil box. On Friday afternoon, I met with a group of Sailor Moon cosplayers for a “Sailor Moon Picnic.” It was a lot of fun to participate in a Sailor Moon photo shoot! 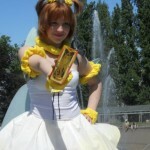 I got quite a few photos of me cosplaying Princess Jupiter taken with a Sailor Jupiter and some other cosplayers. It was this photoshoot that was one of the major reasons I decided to wear my costume all day on Friday. My costume also met the masquerade guidelines and was something I wanted to wear for the Sailor Moon panel. In the evening, just before heading to the Sailor Moon panel I was leading, my boyfriend and I went to the masquerade ball for a short time. It was nice, but the song choices gave it a high school dance kind of feel, since there were a bunch of popular dance songs played while we were there. The selection did not include many slow songs, nor did we hear many j-pop or anime related songs. Last year it was mostly slow songs, so it was really nice for couples and gave those who checked out the waltz lessons a chance to try out what they learned. I would have liked to hear more anime, j-pop, and video game songs this year as well, since it was an anime convention. Those don’t tend to be played in public very much, but the latest pop songs are heard everywhere. It seemed like there were a lot more people dancing this year though, so the change appears to have been a good thing overall! On Sunday morning, the first thing I attended was the Kotono Mistsuishi and Dreamcatchers event. Although the title of the event as written in the pocket programming guide listed Kotono’s name first, she was actually only on-stage for the last twenty minutes of the event. Some audience members obviously grew tired of waiting and left early, before she was called up on stage. The majority of this event was comprised of skits by the “Dreamcatchers” that coincided with some anime clips from properties I didn’t recognize (the titles of the anime that these clips were from were not revealed at the event). This portion of the event was plagued with technical difficulties, and one of the skits was re-done in its entirety, although the only problem they had for that skit was during a live song performance. The skits did not seem very well rehearsed overall, and the fight scenes seemed a bit lacking in choreography as well. Some performers visibly showed hesitation during sword fights, which wasn’t particularly entertaining to watch. Although I understand the importance of safety during sequences like this, perhaps additional practice and choreography could have made for a more interesting performance. The anime and skit sequences didn’t seem to have any correlation to Kotono Mitsuishi that myself and at least some other audience members could discern. If anyone knows what anime the different clips were from, please share the details in the comments! When Kotono was finally on stage, she was asked to do some live dubbing of scenes from a variety of her past anime roles. This seemed a little awkward, since the scene would be played in original, usually without English subtitles, and then the scene would be played again while Kotono voiced her role but all other audio was muted. Kotono did a good job, even approximating the “echo” of one of Boa Hancock’s lines at the end of one of these scenes. Unfortunately, it was a little hard to understand for those of us in the audience who don’t speak Japanese. English subtitles would have been helpful on all the clips so that more fans could understand the demonstration more clearly. To close the show, Kotono sang “Moonlight Densetsu,” accompanied by a live band and the Dreamcatchers who also sang along. With so many voices singing, and the band being a bit loud in comparison to the vocals, it was difficult to hear Kotono’s voice among the rest (we were seated near the front, so the sound may have been more intense that close). The event ended with a disappointing apology from one of the Dreamcatchers, claiming that they had planned a two hour show, but didn’t realize they were going to have a one hour time-slot. This meant that a competition that Kotono was going to judge had to be cut. Later, people complained about this event (perhaps you’ve already seen some comments on other websites? ); regarding the timing and how short Kotono’s appearance was. My boyfriend e-mailed convention staff to say that we were disappointed with some of the technical difficulties this year, while also mentioning that we were highly impressed last year with how smoothly everything went. He also asked about the Dreamcatchers event. The convention representative who responded indicated that there was some faulty equipment that will be replaced before next year’s convention. Also, the representative stated that the Dreamcatchers were told on multiple occasions how much time was actually allotted to them. Convention staff tried to give them extra time, but they were not willing to set back other events in the same room because of an oversight by the Dreamcatchers. I think it’s worth noting that the pocket guide schedule was released on April 7th, a full 15 days prior to the convention. As a panelist, I made a point of looking out for the schedule to verify when the panel would be and how much time I was allotted. It’s strange to me that the Dreamcatchers made it seem as if convention staff was responsible for there not being enough time, when the timing details were released in advance and they should have modified their event if there were unexpected discrepancies; instead of unprofessionally blaming convention staff. I must admit, I was disappointed in the event to the extent that I felt it would have been much better for me to attend something else instead. It may seem harsh, but if I see Dreamcatchers listed in the programming guide of a future convention, I’ll choose to miss their performance. Unfortunately, the Dark Horse Industry panel was scheduled at the same time, so I was unable to catch it. Sorry about that one readers, but I’m sure they have a list of newly released and upcoming titles on their website! 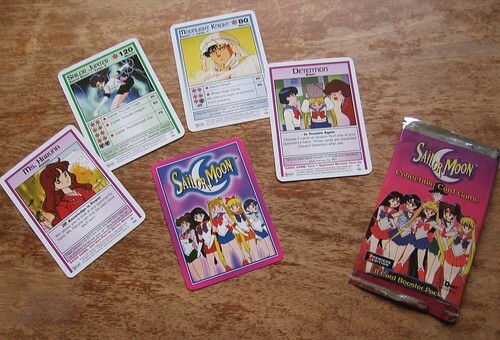 Sailor Moon Trading Cards. A few of the card fronts, a card back, and the package. A view of all the card front is available in an alternate photo. One of the other events I managed to catch a portion of on Sunday, after lunch, was the “State of the Industry” panel, which had representatives of Funimation, Bandai, Dark Horse, and MGS. One of the major topics of discussion during this panel was the problem of piracy and how it hurts the anime industry. Companies are currently making efforts to lessen piracy and illegal downloads, but there is no expectation that piracy will disappear any time soon. The panelists even indicated that they expect piracy to always be a problem in some form. Panelists encouraged the audience to use legal methods of viewing anime such as authorized streaming and simulcasts (many of these are free, but ad-supported). There are also companies who sell combo releases of Blu-Ray and DVD together. Costs are able to go down for these items as they take up less shelf space while offering multiple viewing options for buyers. It seems to be just one of various efforts being made to keep anime affordable, in order to encourage ownership and reduce piracy. Regarding e-manga, there is currently no simulcasting type efforts in place for manga series. However, Dark Horse is interested in having releases online sooner and making efforts to find a way for faster online publishing to become a reality. My boyfriend and I had to leave the convention early (it was Easter weekend and we had plans with family) so we did not catch the closing ceremonies this time around. All in all it was a great convention experience. Although there were some technical difficulties, staff was great about dealing with issues as fast as possible. I have seen things get much worse at other events when there were unexpected (or sometimes even plausibly expected) issues that had to be addressed for a safe and pleasant convention experience. I’m quite glad that Sakura Con staff shows that they care about having events run as smoothly as possible by dealing with any unforeseen issues quickly and professionally. It’s also encouraging to know that faulty equipment will be replaced before next year, to ensure things run even more smoothly. I’ve only been to Sakura Con twice now, but I have to admit it’s one of my favourite conventions to attend. There’s an awesome variety of events, a large dealers’ room with a plethora of items to entice fans, and you get to see some of the most interesting costumes – from anime to video games to Disney princesses. 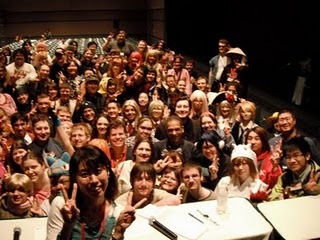 It was also exciting to lead the Sailor Moon panel, despite my initial nervousness in front of a large crowd. I plan to be on more Sailor Moon (and other!) panels in the future. It’s a fun way to interact with fans. Here’s hoping I see more readers at future conventions. And maybe I’ll make it to Sakura Con next year too! This interview was recorded on video by Nico Nico, who have recently launched their U.S. site. If anyone has found the video, please let us know and we will add the link! To start things off, Nico Nico asked Tiffany to record a message to anime fans in Japan. Tiffany said that she send warm wishes and prayers. She also wants to send love to all anime fans, as it allows her to continue doing the work she loves. The last time Tiffany was at Sakura Con was in 2000. She said it seemed like the 2011 convention was twenty times larger, so it’s a huge difference from before. She also said she was very impressed with how well run and well organized Sakura Con is. When it comes to cosplay, Tiffany is always excited to see fans cosplaying the characters she’s played, especially Asuka from Evangelion. Fans can also see pictures of Tiffany cosplaying some of her own characters in the photos on her website. Tiffany said that her most “famous” line would have to be “what are you – stupid?” from Evangelion. Fans can hear voice samples on Tiffany’s website here. She really liked that Asuka is a multi-faceted character and commented that the studio atmosphere is different for more serious scenes. When preparing for a new role, Tiffany said she clears her mind and tries to start fresh for each role. She also listens to the Japanese performance to see how things were done, before recording in English. Her performance is informed by the original video as well as the director’s input. She also noted that she often goes with her gut instinct of what feels right for the scene. Tiffany has a background in theatre, even from the time she was a little girl. She has now been voice acting for over seventeen years. One of the reasons she got her first voice acting job is that she was an actor, so she got called to the audition. She was new to anime at the time. She always had an interest in voicing, particularly mimicking voices and accents. 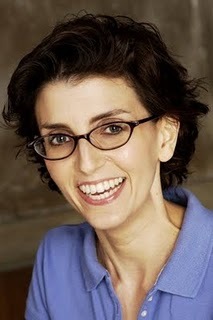 Even as a child she made the connection that actors played the voices of cartoon characters. She wasn’t originally sure how to get involved in voice acting, but when that first audition for a voice role came up; she went for it. Tiffany said she has been able to do a huge variety of characters because she does voice acting for anime. She loves her job and especially likes playing critters who make silly sounds. Tiffany said that she finds voice acting is a very broad style of acting that is dramatic and requires projecting, which is similar to theatre acting. However, if being physical in a voice acting role, an actor needs to be conscious of the microphone placement. Does Tiffany watch anime for fun? Sometimes she does. She said that she enjoys Miyazaki films and also really liked watching Fullmetal Alchemist. When watching anime, she doesn’t tend to think that she’d rather play a character that has already been done, she just tries to enjoy watching it. As a big Hello Kitty fan, Tiffany is always wearing something with Hello Kitty on it. At the interview, she was wearing a ring, watch, and had a bracelet charm that were all Hello Kitty related. Aside from Hello Kitty accessories, she was also wearing little Asuka earrings! 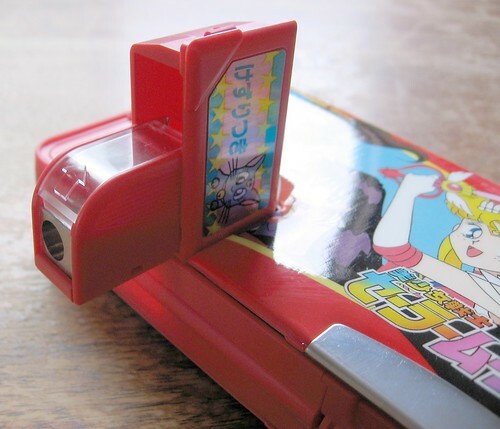 The manga series Gunsmith Cats: Burst! – which was the sequel to Gunsmith Cats – ended its run in North America last year, with the final volume being published in April 2010. Tiffany said that she hasn’t read any of the manga volumes (of either Gunsmith Cats series, but she heard about how popular they were and that the series was a longer one. 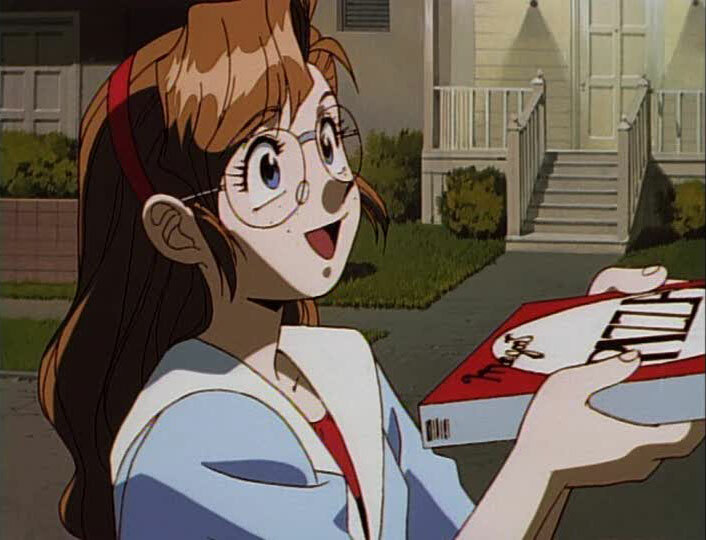 Tiffany played Becky Farrah in the OAV series of Gunsmith Cats and said she would love to play the role of Becky again if there were more episodes were made. She also said she found that character was the most like herself. On her website she even says that the voice of Becky is very close to her natural voice and she includes a clip of the “no pizza, no Chinese” line in her vocal samples. Here’s a fun fact for Moon Chase readers: Tiffany played the same character as Kotono Mitsuishi in Blue Seed. The character was Kome Sawaguchi. Tiffany said she was excited to be able to meet Kotono at Sakura Con too! In closing, here’s a little information about a charity effort that Tiffany participates in: Voices For is a group of pros, mainly in the voice acting industry, that makes albums for charity. Tiffany has contributed to both albums which are currently available. More details about the charity effort are on the Voices For site. Bandai representatives reminded attendees that their online store is available at store.bandai-ent.com – this store includes exclusives before they go to other vendors. This panel also experienced some unfortunate technical difficulties, but this time there was video and partial sound. I had to leave part way through to go to an interview (to be posted tomorrow! ), but I heard that convention staff was able to fix the issue before the end of the panel. The details at the end of this post I found via the Bandai online store. Released April 26th, but also available at the convention. This 26 episode series from Sunrise was released April 26th and was also available ahead of schedule at the convention. Two disc set includes the movie on Blu-ray and extras on DVD. Released April 26th, but also available at the convention. This 26 episode series from Sunrise is based on the Namco Bandai game. The first volume includes episodes 1-7. Limited edition release includes a copy of Asch the Bloody manga volume one, regular edition (without manga) also available. Release date: June 7th. This hybrid release is coming July 5th to DVD and Blu-ray. The movie is the final chapter of the Gundam 00 saga. DVD volume one will be released June 7th, is currently available for pre-order, and will contain two episodes. The packaging features a reversible cover. This title is already available on Blu-ray, with volume three currently available in Bandai’s online store and in the Amazon Marketplace. The original 42 episode series, to be available in a two part Anime Legends hybrid release. Coming this summer. 50 episode series, new to North America. To be released in late summer as a subtitle only release. Baccano! Blu-ray limited edition boxset, available May 17th. Currently available for pre-order. Durarara DVD part 3 available spring 2011, available for pre-order online. K-ON! volume 2 on Blu-ray and DVD June 14th, currently available for pre-order. Girl Who Leapt Through Space volume 2 available June 7th, currently available for pre-order.